Pinterest launched in March 2010, and has rapidly become a powerhouse in the social media space, whipping up $27 million in their last round of funding, and becoming perhaps the only thing that has drawn this much attention from my wife since Angry Birds. Since I keep tabs on these types of things, partially for my job, and partially because I am addicted to social media, I was intrigued by the concept already. A wall full of inspirational-type things? As a designer, that’s right in my wheelhouse. So when my friend Kylene offered me an invite shortly after launch, I immediately signed up. Most social networks encourage you to connect with everyone you know. Facebook is built upon the relationships of people you know. Twitter, in comparison, allows you to follow people you’d have no connection with otherwise. Pinterest falls somewhere in the middle-your first instinct is to follow everyone you know personally, and ignore the ones you don’t. So when I signed up, I dutifully followed Kylene, and everyone that decided to follow me afterwards. Now, if I were planning a wedding, had a fascination with women’s shoes, or was addicted to faux-inspirational artwork, this would be my thing. But it’s not. In any way. So, not really finding a use for it (like Google Plus), I just let it sit and gather dust. Every so often, I’d login to see if anything new was popping up, and I’d occasionally pin things of my own to my wall, though I found the process to do so tedious. Once, just out of curiosity, I searched the Sports tab, just to see if there were any guys using this thing. My result-and I swear this is true-was page upon page of shirtless athletes. Hell, even doing research for this article, I came across several sites that essentially claimed that the site was for women. One advised, “if you haven’t heard of it, find the nearest twenty or thirty something woman. She […] can tell you all about it.” Another marveled, “Men join Pinterest too!” Maybe Pinterest just wasn’t for me. But at my Creative Mornings chat a few weeks ago, Jenny Lam pointed out several famous companies that were founded by designers, and Pinterest was one of the ones that caught my eye. And as I’ve done more research into the startup world, I wondered if there was something I was missing. If this wildly popular site was started by a creative (Evan Sharp, Designer at Facebook), then surely there’s gotta be a way to make this work for me. I logged into Pinterest, and surveyed the situation. The big problem for me was, while I love all of my lady friends who post on Pinterest, most of what they are pinning just isn’t interesting to me. So I had to unfollow them. This largely goes against your instinct with social networks-you’re most likely to want to interact with people you know, as opposed to strangers. But in this case, Pinterest created a weird loop where while I’m definitely intrigued by the Cinnamon Roll Loaf my wife posted, it’s not what I’m looking to get out of the site. So I unfollowed her. But Dwight! You unfollowed your wife?! Exactly. With Facebook, I want to read everything Melissa finds interesting throughout the day. Same with Twitter. Or Tumblr. Or Instagram. 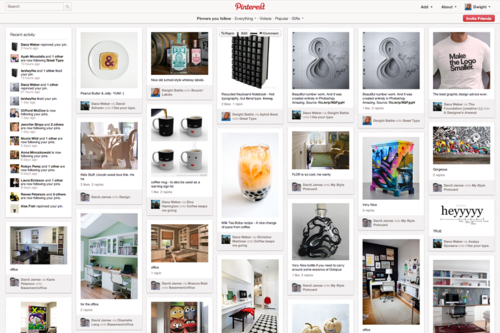 But with Pinterest, at least for me, I want a wall of design-related things that would inspire me to do great work. A wall for me. Cinnamon loaves won’t do that. They just spike my blood sugar and make me sleepy. So I wound up unfollowing all but a couple of people, and a handful of boards. This creates the second problem. I don’t have a lot of friends who are designers. I’m working on that. But the ones I do know, aren’t using Pinterest, as far as I can tell. It’s nigh impossible to do a people search. For example, if I type “Melissa” into Facebook, Facebook knows I’m looking for my wife. Type “Melissa” into Pinterest, and I get a lovely lady, who is unhip but still totally awesome, but isn’t my wife. It would be great if the search was improved. It’s down now, so maybe they’re working on it. Eventually, I was able to find enough designers and people on Pinterest that I wanted to follow. And now my board is full of creative inspiration-and I’m now more likely to use it. I’ve been pinning font-heavy design like crazy, because I love that stuff, but I’m also starting to pin some designers that are doing some great work. So guys-don’t count out Pinterest just yet-just be a little pickier about who you follow. It makes a world of difference. There are a few things I’d like to see Pinterest add into the mix, that would help the creative in me that wants to share great design. First, make it easier to manage the people and boards I follow. I shouldn’t have to dig through each person on my list to follow or unfollow them. Secondly, make it easier to find like-minded people and boards to follow. Where’s the recommendations? Finally, It’d be great to find out if someone pinned some work of mine. How about Behance, Dribbble or Tumblr integration? I think Pinterest has the potential to be a great resource for designers. I’m slowly starting to squeeze Pinterest into my daily social media schedule. And as I come across interesting design, it’s now easy to send things to Pinterest with a click, so expect to see more out of me soon. Designers: leave your links in the comments below. If you need an invite, let me know. Let’s get our own community going! 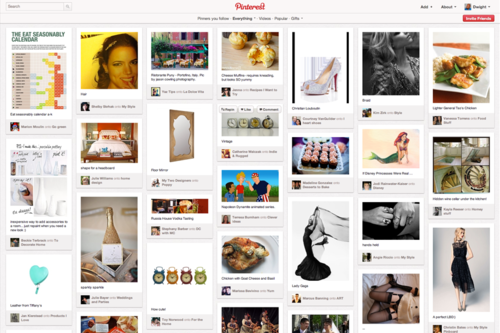 UPDATE: Probably the biggest nod to Pinterest’s success are the competitors that are rapidly popping up. Two have launched just this month, and will be worth keeping an eye on. Gentlemint, the “mint of manly things”, and “one of the more manly websites on the planet”, launched just this week, as if they knew I was writing this piece. Born from two Kansas developers, it was hacked together in a 12-hour marathon, and is currently in a invite-only beta. If I can snag an invite, I’ll be writing about this one very soon. Chill aims to be the Pinterest for video, having started as a Turntable for video, then pivoting after receiving some user feedback. It’s open for registration now.